The industry has been changing over the past few decades and new engineered stone products, also known as quartz surfaces, such as Silestone, Cambria, LG Viatera, Zodiaq, and countless others are now found in kitchens, baths, and other applications in homes and businesses across the country. Quartz surfaces are popular because they are harder than granite, easy to clean, and look great for a long time. While many of these products are often sold as “maintenance free,” quartz is not indestructible. 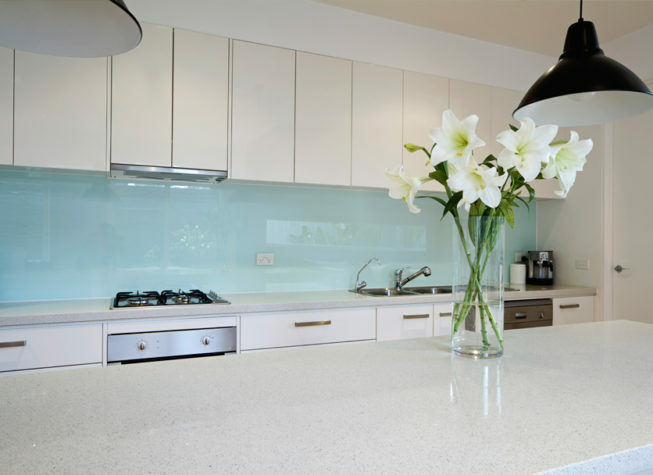 With extensive use, quartz surfaces can eventually become scratched, stained, or otherwise damaged. Fortunately, most of these problems can be corrected with our professional restoration services. At Godoy Stoneworks and Tile Care, we have the technical knowledge, experience, and state-of-the-art equipment to handle virtually any problem with quartz applications in residential or commercial properties. At Godoy Stoneworks and Tile Care, we can instruct you on the proper day-to-day care of your quartz surfaces. We offer a free, downloadable Care Guide and can recommend Care Products to help you keep your home or business looking great. We also provide a regularly scheduled maintenance program, upon request. For a FREE estimate on quartz cleaning, repair, and other services for engineered stone in Broward, Palm Beach, Martin, and Indian River Counties, fill out our online contact form or call (561) 502-0692 or (561) 797-9592 today.